Anyway, I hope you enjoy playing this map! It's definitely the longest I've ever worked on a single map, with work first starting over a year ago. Of course, I wasn't working for a solid year, but it still has taken a really long time! The map works in all modes, although you need the latest SVN of Tesseract for it to function properly in teamplay, and take advantage of fancy graphical features like volumetric lighting! Also, this isn't a small map, although it is pretty compact. I would recommend at least 6 or 8 players minimum if you want to have a good time with this map, otherwise it can be hard to find each other. Although the map is already in the game, if you do notice any errors feel free to let me know, i'll try and get fixes included as soon as I can. Thanks, and have fun! This texture pack is pretty nice, im working too in a map with this same textures for sauerbraten. The layout seems to work, and the lights are great, specially in the room with the vents and the red lights. I find that the use you did for some particular textures are not used in a correct way, some floors textures are in the walls, or in the ceiling, or doors textures as box textures (Those last go unnoticed because of the lights and vscale) but the rest feels like an odd mix, even when they are textures of the same pack. And for some reason, this map is the only that takes some time to load, it get stuck in "generating environments map" like for 5 minutes, i dont know why, but the first time worked perfectly. You're the first person I've heard commenting about the texturing in this map, which is interesting. I tried quite hard to only use textures from the philipk2 texture set, so I had to get pretty creative with how i used them. I tried to limit "re-using" textures though, so as far as I know i never took a texture that i used on a box and used it for say, a set of doors as well. Regarding the floor textures being used in the walls or ceiling, could you provide any examples? I'm struggling to find any examples of what you mean. I'm glad you like the lighting, I was quite proud of the effect i created with this map. Thanks for commenting! Sorry, the generating environment maps is probably a problem of my PC, hardware or the version of tesseract i downloaded. 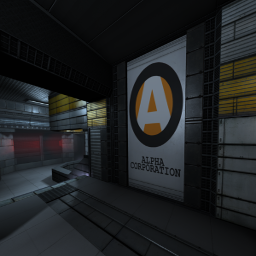 In front of the Alphacorp logo -the same in the screenshot- there are floor textures in the walls, and there are two in the room with ground (The circular one) Maybe it's not so important, but i noticed in the exact time when i saw them. Oh right, I see where you're talking about now. I get your point, but I don't think i'll be changing those textures. I don't really have anything better to replace them with, and the area needs those details to avoid being bland or boring. Thanks for taking the time to explain your points however, I'll keep this in mind for future maps.